The bus headed off to San Antonio, an hour and change to the south. To offset the risk of starvation, ChiTownDiner passed around freshly-baked empanadas from Golden Crown Panaderia. (I didn't manage to get a good picture.) I sampled both the sweet potato and the cherry empanadas, and both were outstanding. These empanadas resolved me to visit Golden Crown Panaderia myself. 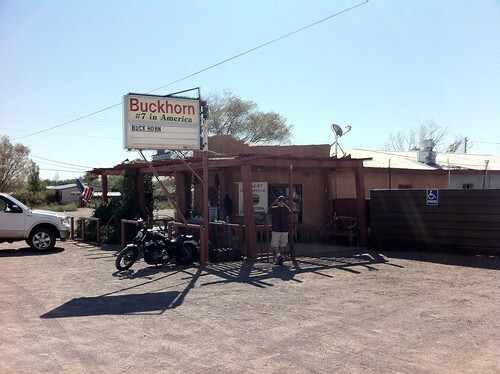 Our first stop in San Antonio was Buckhorn Tavern, which is proud of being selected as the #7 cheeseburger on some top ten list. (GQ, I think.) They have a limited space and are a popular stop, but they didn't open specially for us, so we were relying on being there right as they opened at 11 to get a spot. As we waited, Michael Stern lifted his nose at the aroma of chile peppers roasting at a nearby farm stand. 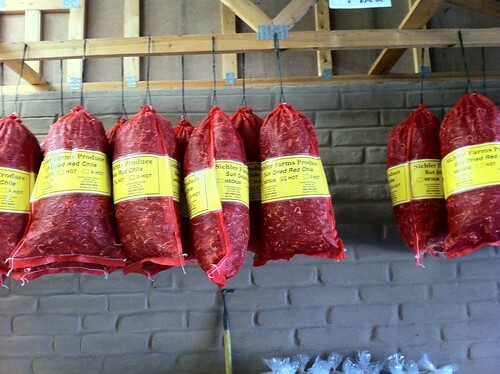 The folks at the farm stand (Sichler Farms Produce) were extremely friendly and welcoming; I quite enjoyed seeing the chile roaster and all the chile products they had. I would have bought a small bag of chiles as a souvenir, but this was as small as they had. I bought a cookbook instead, because I wanted it to be profitable to them to be so friendly. I bought a bottle of Carrizozo cherry cider at the gas station. I've concluded that cider is best drunk in fairly small quantities. At first, I love how tart and lively it is - it's much more tart than apple cider or other cherry ciders I've tried. But after eight ounces or so, the tartness starts to taste artificial - the more so after I read "citric acid" on the ingredient list. But those first few swallows - man, that's good. 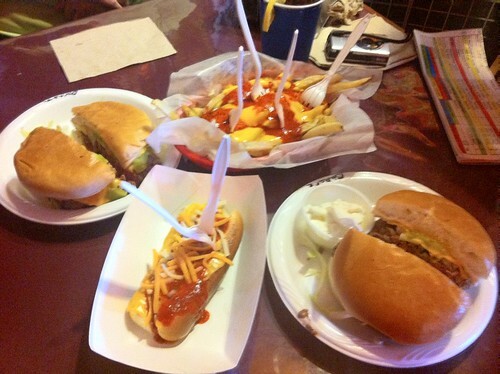 Our table ordered a green chile cheeseburger split four ways and a red chile hot dog. This photo is not actually our table, but the table next to us, who ordered much the same thing. The chiles on this burger were raw and spicier, which made them stand out much more in taste and texture than any of the other green chile cheeseburgers I ate on this trip. 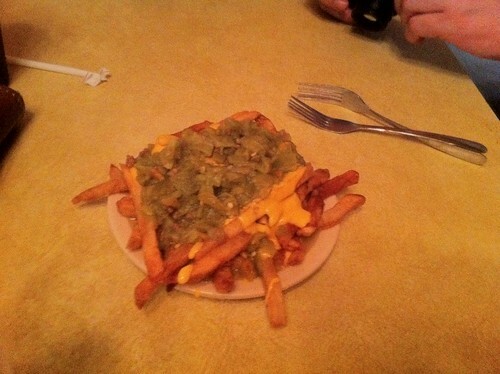 I did not care for that myself, but other folks at the table considered this their favorite green chile cheeseburger for exactly this reason that I considered it my least favorite. 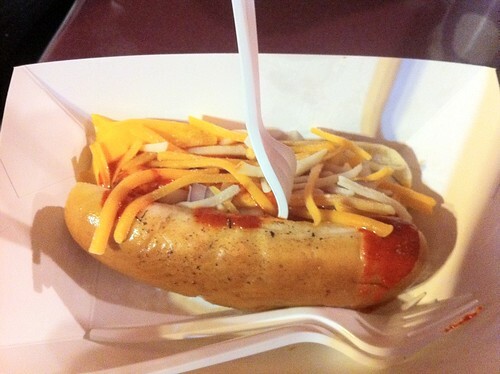 I actually liked the red chile hot dog much more; it used a nacho cheese instead of the American cheese on the burger, and that cheese engaged the hot dog and chile sauce very nicely. From there to the Owl Bar, where we were assigned to an unphotogenic room in the back. 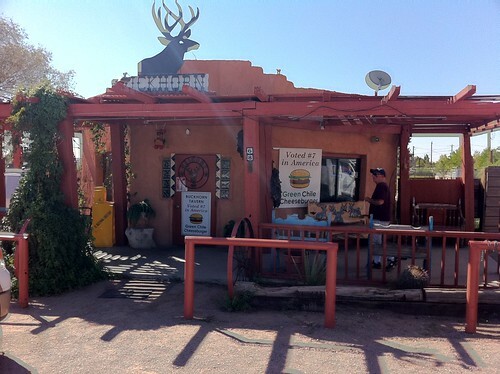 The green chile cheeseburger here had a very thin patty like the Buckhorn's. 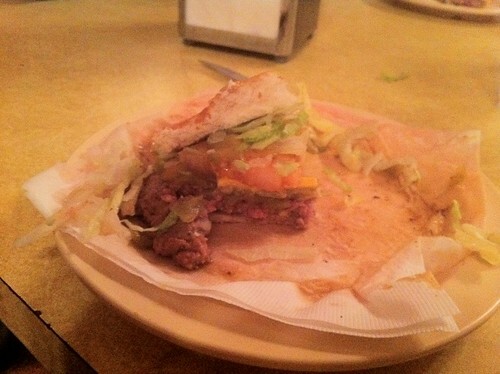 I was impressed that with such a thin patty, they still got pink in the middle of our medium rare burger. 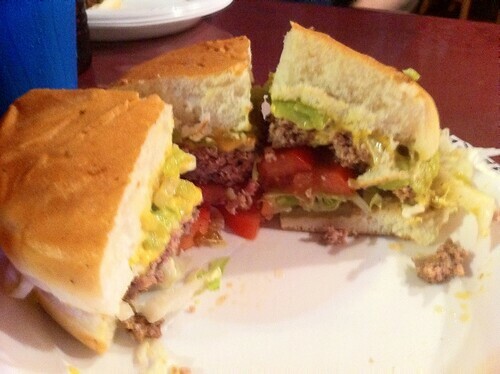 This burger was extremely juicy and messy - probably the messiest of the burgers I sampled. 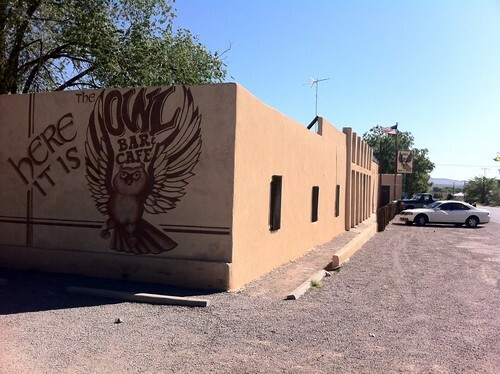 I'm not sure I sampled the green chile fries at either the Buckhorn or the Owl Bar, but the Owl Bar's have a whole lot of green chile compared to the Buckhorn's above. 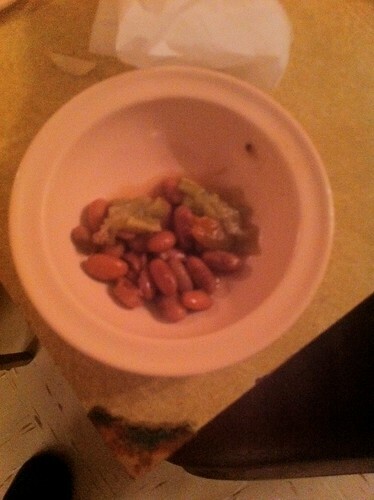 As a freebie, the waitress brought out a sampler of beans. 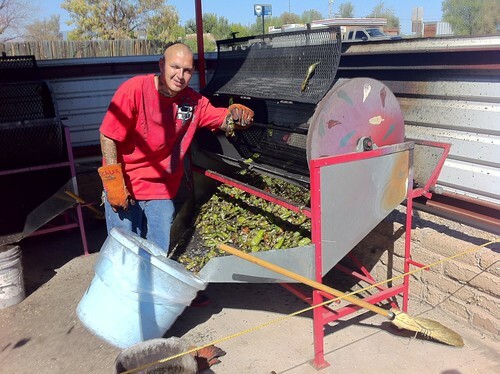 They were good beans, with a whole lot of green chiles. My favorite part of the indoor talk was probably the pamphlet on how to taste a chile pepper. 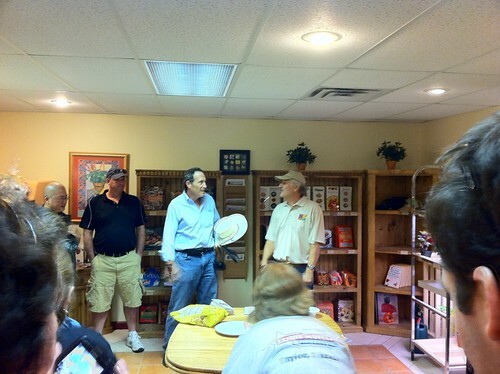 I hope that someone can contribute a photo of ChiTownDiner in the bright yellow chile bowling shirt he bought. As he said, "you can wear this with confidence that no one else will be wearing the same thing." 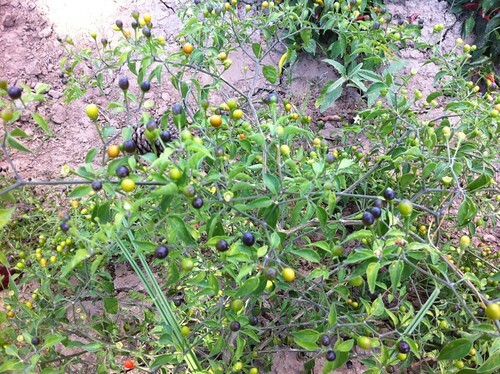 This is a variety of chiltepin, the wild ancestor of chiles. 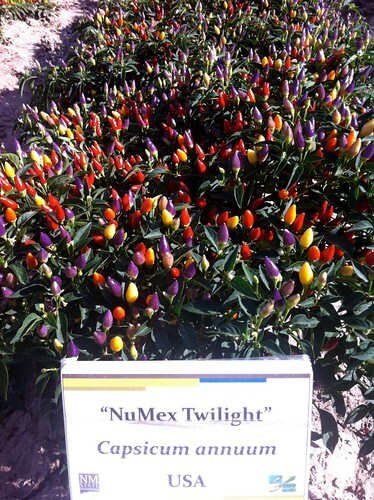 It's a lot smaller; humans have bred chiles for much larger fruits. This is one of several decorative chiles Paul showed us, suitable for planting in a garden. 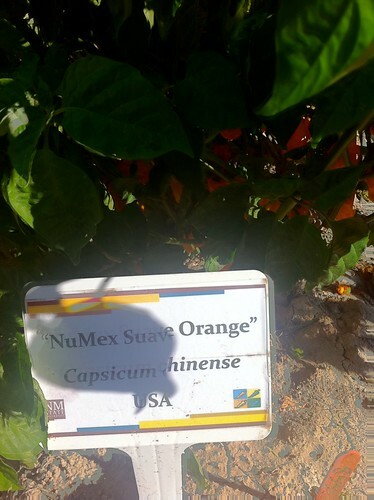 This one was bred as a chile one might grow in a pot. 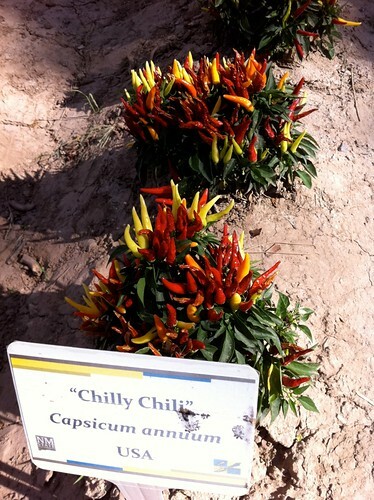 According to Paul, in the early half of the twentieth century, the usual plant given as a gift was a chile. 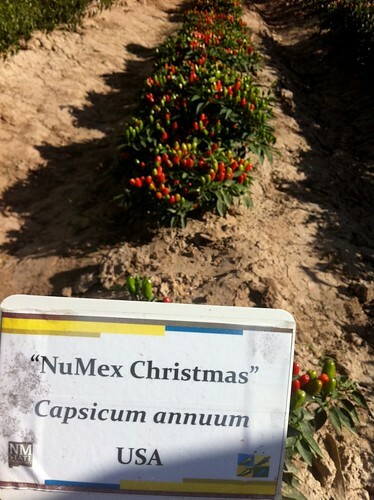 Poinsettias have now usurped that role as gift plants for Christmas, but Paul is breeding chiles with color schemes suitable for every other holiday (orange and green for St. Patrick's Day, for example). Another decorative chile, which I find extremely attractive. 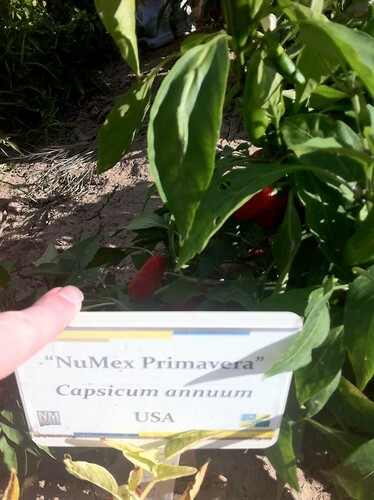 This chile earned Paul an Ig Nobel Prize: it's a heatless jalapeno. What's the use of a heatless jalapeno? Well, consider a salsa producer who is trying to produce a salsa with a consistent level of heat, but whose jalapeno crop has come in extra-hot this year. This heatless jalapeno allows that producer to dilute the heat of the jalapenos, but have the whole batch taste like jalapenos instead of, say, bell peppers. 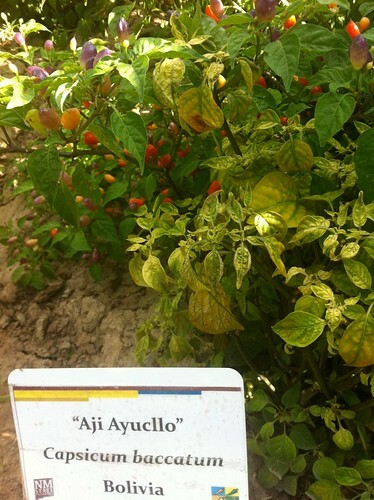 This is an Aji pepper, from South America. It has a somewhat citrusy aroma. Mexican food practitioners apparently feel the taste is wrong for Mexican food, but Paul has hopes that this will catch on in the US. 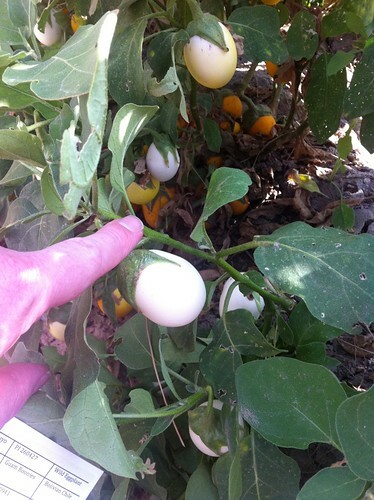 This plant is the answer to the question "why is an eggplant called an eggplant?" This is a wild eggplant, the ancestor of varieties that have been bred to be large and purple. 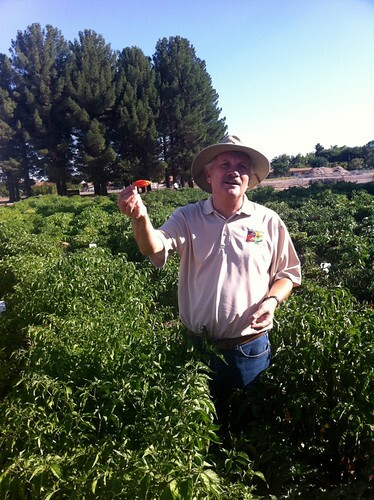 In this picture, Paul is holding the bhut jolokia, the world's hottest chile. Unfortunately, I failed to take a picture of the moment a few minutes later in which Paul demonstrated his confidence that all the capsaicinoids are in the seeds and membranes by holding the bhut jolokia up to his eye. Paul had said that he couldn't invite us to pick any of the chiles, for reasons of legal liability. However, he made it clear that he wouldn't take offense if we were to pick any of them. 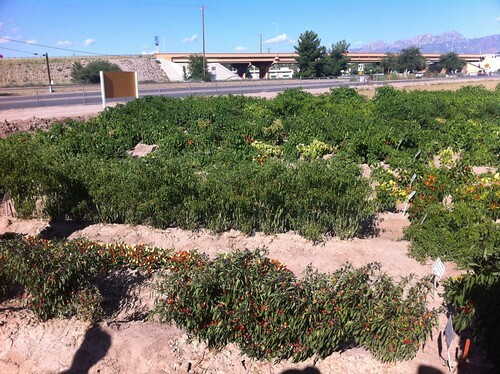 Chris Ayers did pick one of the bhut jolokias. I expressed hesitant willingness to sample a small amount, but he eventually decided to send it to Mariton, who has demonstrated a remarkable affinity for spicy food. I hope to hear reports of her jolokia experience. A bad picture of a heatless habanero. I asked Paul if he was working on a heatless jolokia - he said no.